This entry was posted in Backyard beekeeping, Honeybees, Pollinators, Uncategorized by Tina. Bookmark the permalink. Beautiful and its always heartening when I see a honeybee. Yes, pollinators at work are a definition of life renewed. I like the color of your background, too. I think you must have just changed this to suit the flowers. Very pretty. Haha. That’s exactly what slinked into my brain, though I resisted! Actualy, the background color is the same, just a lot of red…. Brilliant! Very nice poppy too. Thanks, Allison. I avoid poppy shots, just because everyone does poppy shots. But I couldn’t resist the bee activity, they adore these flowers. Another great shot! My yard is full of all kinds of bees and some butterflies this year. I’m not sure what changes year to year, but I am happy to see more butterflies and bees too. Yay for pollinators! Like you, I notice that some years my garden is full of “x” butterflies and the next, of “y” butterflies–not sure why, but as long as there are bees and butterflies (and birds, of course), I’m cool. Great shot! As usual, I have poppy envy…yours are gorgeous. I’m seeing swarms of bees around our bottlebrush tree just now… Seems the little sweeties are all about the red flowers at the moment. Last week it was one particular yaupon covered with tiny white flowers drawing their attention. So good to see busy pollinators! The poppies great bloomers each and every spring. I love bottle brush, but have never grown one and I know that bees really like that plant. 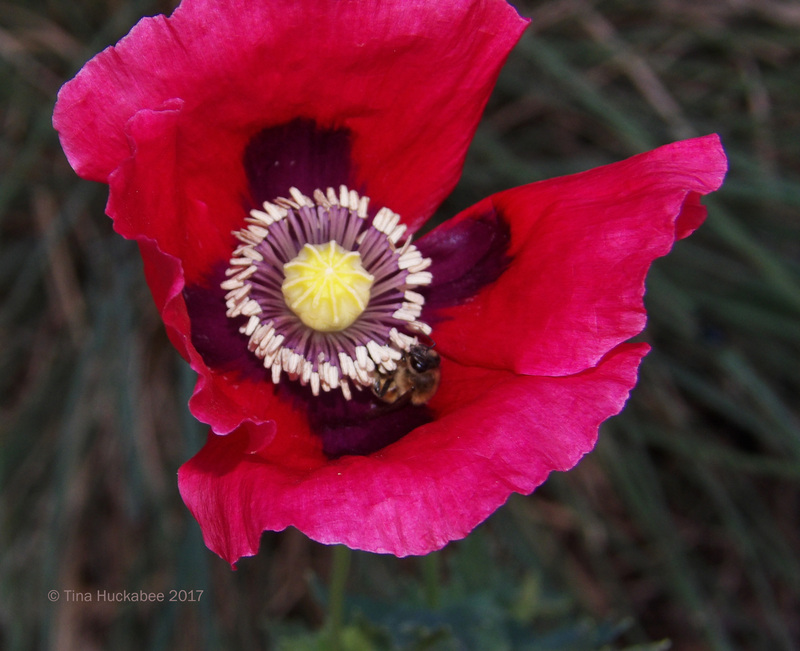 Tina is wonderful to see three bees together in a beautiful poppy. I hope you have many more poppies full of bees. Greetings from Margarita. Most of the poppies have bloomed, but there are a few other waiting in line. Thanks, Margarita! Nice to see the honey bees Tina 🙂 I’ve spotted few around a Crocus clump but then the weather has turned very rainy and even a bit of snow… But the warm-up is coming. I’m sure your honeys are happy to have the crocus available to them. I hope you weather patterns slide into spring soon! Yes, it seems spring is here, but not many things in flower yet and so the Crocus are very, very useful. Interesting that in the wild flora as well there are very few species to flower so early. They know how cold it is there! 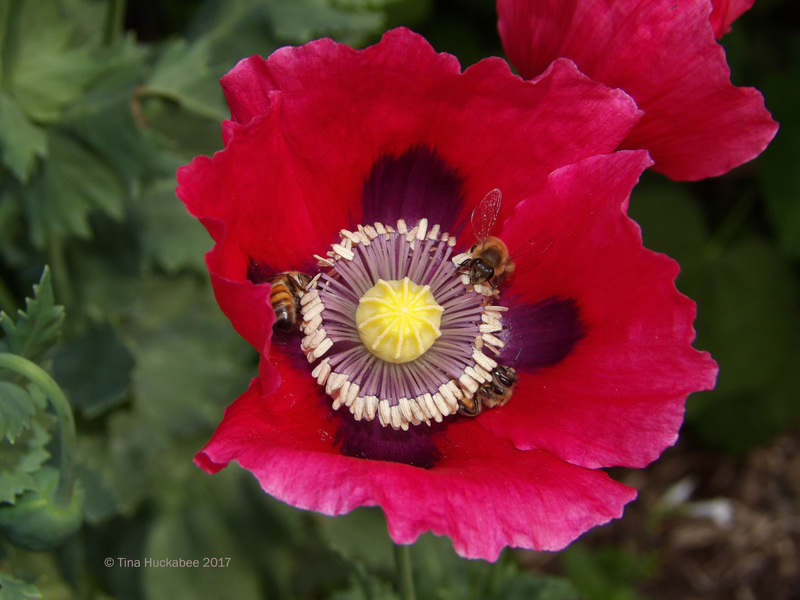 I always think that poppies must be somewhat addictive to bees because when they get in there they move around in a frenzied manner as though high on drugs. Nothing will disturb them. 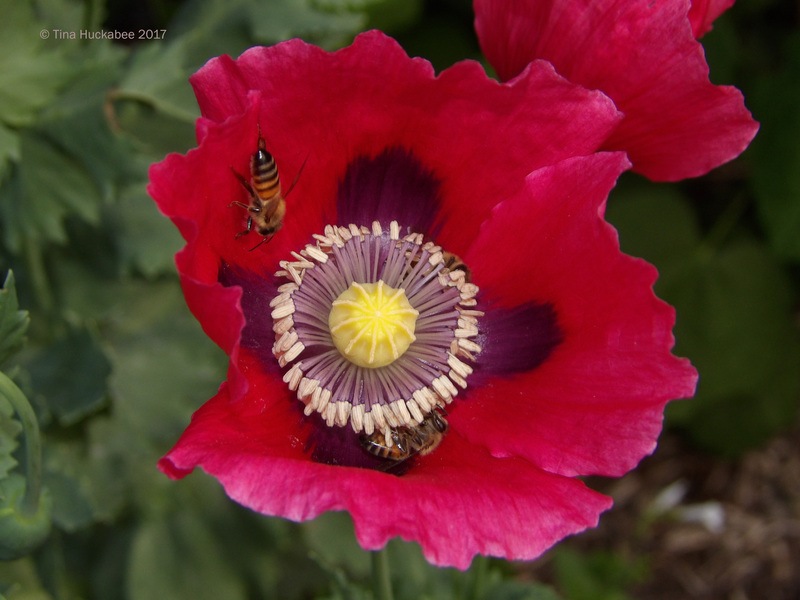 Yeah, they’re mind-mannered, lady-like bees until they’re deep into poppies, then they become wild girls!